Today we packed up all the equipment for the goldsprints bicycle race and loaded it onto our Natooke tricycle. 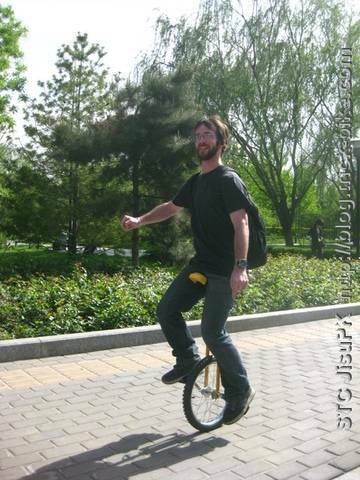 Jib cycled with us on a unicycle getting even more attention than the foreigner on a tricycle. It was a beautiful day today to be in the Ditan park of Beijing and set up our stationary bicycle race on my fixed gear bikes. This was already the second day of the annual Folk music festival and Beijing’s best folk rock music bands were playing on this sunny Sunday. This is already the third time that we are organizing a goldsprints event in Beijing. And this is also the third event in all of China as we STC are the first ones to organize these fun bike races in the kingdom of bicycles. We call it JisuPK which means roughly high speed challenge and gets the Chinese interested. And it was even better to see Chinese woman race and ride hard and fast. Go girls go! 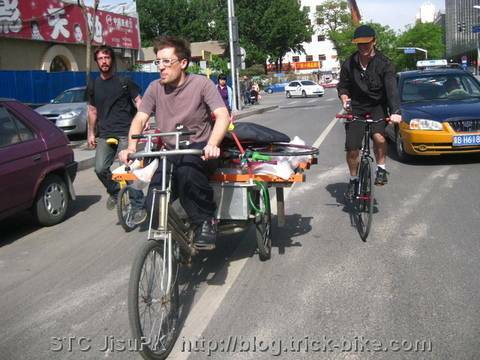 This entry was posted on Sonntag, Mai 9th, 2010 at 22:29 and is filed under Beijing, China, Cycling, Fixed Gear, Music. You can follow any responses to this entry through the RSS 2.0 feed. Both comments and pings are currently closed.